Prominent & Leading Manufacturer from Chennai, we offer electro permanent magnetic lifter, industrial permanent magnetic lifter, permanent magnetic lifter (on/off type), permanent magnetic lifter, permanent magnetic pulleys and magnetic head pulleys. Electro Permanent Magnetic Lifter is the result of our sound reputation as manufacturer, supplier, and exporter which encouraged us to design, manufacture and supply it to our patrons. Industrial Permanent Magnetic Lifter is the result of our sound reputation as manufacturer, supplier, and exporter which encouraged us to design, manufacture and supply it to our patrons. Permanent Magnetic Lifter (On/Off Type) is the result of our sound reputation as a manufacturer, supplier, and exporter which encouraged us to design, manufacture and supply it to our patrons. The Permanent Magnetic Lifter is the result of our sound reputation as manufacturer, supplier and exporter which encouraged us to design, manufacture and supply it to our patrons. We are one of the trusted names in the market to offer a highly durable range of Permanent Magnetic Pulleys (Magnetic Pulleys). We are one of the trusted names in the market to offer a highly durable range of Magnetic Head Pulleys (Magnetic Pulleys). We are one of the trusted names in the market to offer a highly durable range of Industrial Magnetic Pulleys (Magnetic Pulleys). 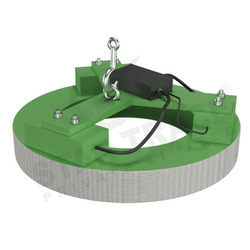 Circular Lifting Magnet are of robust cast and bolted or fabricated construction designed for handling solid slabs, steel ingots, bloom billets, pig iron, light finished parts, scrap and gives maximum reliable, efficient and economical performance in the most arduous service condition. shells of circular lifting magnet are made from high permeability steel casting as per is:4491(bss-1617), properly machined, to provide the most efficient magnetic circuit. the periphery of the magnet is heavily ribbed to give added mechanical strength and an increased radiation surface to aid cooling. center & outer poles are machine from high permeability magnet steel with cored recesses arrangement to protect heads of through tensile bolts. the faces of poles from spigot joints in magnet shell, the outer poles of larger magnets are skirted for added. the pole shoes are easily replaceable. Rectangular Lifting Magnet for handling steel plates, bars, billets, sections and tubes can be designed and manufactured to meet customer's requirement the construction of these rectangular lifting magnets is similar to above with cast steel shell and poles fabricated from low carbon steel. very long loads can be handled with two or more magnets spaced on a spreader beam to maintain equilibrium and ensure adequate supply factor. At air-gap: s.w.l of lifint mm kw v kgs a/300 kgs b/100 kgs chain kgs. The Coil Lifting Magnet’s electromagnetic property is used in the automatic handling of metal sheets.Through the application of controlled DC electrical Current, electromagnets offer controlled holding power and on- command release of ferrous steel parts. Provide concentrated holding power and high responsiveness in manual or automatic applications. 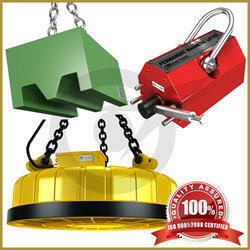 Permanent Lifting Magnet is made up of two parts, such as permanent sucker and discharge device. The permanent sucker is made up of permanent magnet and magnet-conductive plate. the magnetic force wire generated by the permanent magnet will go through the magnet-conductive plate, attracted materials and form a closed circuit thus to achieve the purpose of lifting the steel materials. Tt is suitable for being used to lift and transport magnet-conductive billets, plates and rounds in industries of mechanical engineering, metallurgy, shipyard, car factory, dock and etc. Tested more than 3 times the rated lifting capacity on grinded finish thick steel material lightweight and compact dimensions with low height made with high energy rare earth ndfeb magnets easily transportable actuating lever with positive spring lock inherently intuitive design to prevent actuating on non-steel or thin material handles flat and round loads. 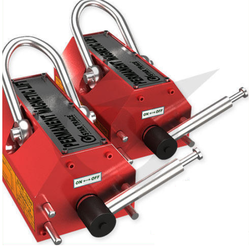 Electromagnetic Lifter is special equipment which utilizes the electric&magnetic physical quantity to lift attached materials and has become indispensable when to lift and transport ferromagnetic materials in lines of metallurgy ,mine, machinery, shipbuilding and transportation,etc. it can also be used as electromagnetic manipulator, magnetic force centring, bar length fixing and so on in some fields,as the attached materials are diverse,the electromagnet structure, magnetic circuit and manufacturing process are also different,so there are many series of strong targeted products. For cast ingot,steel ball,pig iron,machine chip. For various kinds of steel scraps,return scraps,cropping,baling scraps and etc.in foundry factories. For iron powder in coal washery. For removing large size of iron at initial step. 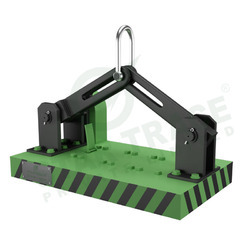 The electromagnetic lifter can be fitted on excavator or crane. The protection plate for coil adopts abrasion-resisting and shockproof rolling high-manganese steel. 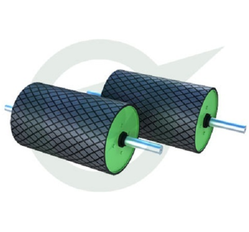 The electromagnet is dealt with special technology, thus insulation grade can be up to grade f.
Coils of magnets are made of aluminium (flat aluminium wire covered by double spun glass) or cooper. 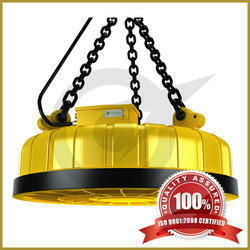 High lifting capacity, light self-weight. Automatic Lifting Magnet is made of strong magnetic material adopting ratchet wheel and pallet mechanism together with the raise of travelling crane to control the mandrill and automatically absorb and unload the materials, featuring no electricity consumption, convenient and safe in operation. It is widely used for lifting and transporting short and thick plates in the factory, dock, warehouse and transportation department. The air gas adjusting rod is equipped in particular which can adjust the magnetic force conveniently. For Lifting Magnets we are the leading manufacturer and supplier.. Our range of industrial lifting magnets includes Permanent magnetic lifter, Circular lifting magnet, Rectangular lifting magnet & Coil lifting magnet. 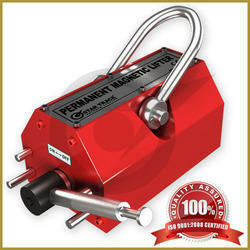 The Permanent Magnetic Lifter is the quickest, safest and easiest way to lift ferrous materials and work pieces. 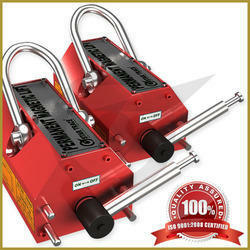 These are two Pole Permanent Magnetic Lifters. The two poles are at the bottom of the lifter. These lifters use high grade Magnets for producing strong magnetic flux path through the two poles. The lifter is placed on the MS flat/block that is to be lifted. The turn of the handle in its ON position with MS flat/block/cylinders (to be lifted) at the bottom ensures completion of magnetic flux path through the MS body. The MS body gets attached to the lifter. The turn of the handle in its OFF position detaches the MS body from the magnetic lifter. 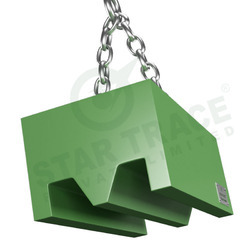 STAR TRACE Circular Lifting Magnet or Load Lifting Magnets are of robust cast and bolted or fabricated construction designed for handling Solid Slabs, Steel Ingots, Bloom Billets, Pig Iron, Light finished parts, Scrap and gives Maximum reliable, efficient and economical performance in the most arduous service condition. Shells of Star Trace Lifting Magnets are made from high permeability Steel Casting as per IS:4491(BSS-1617), properly machined, to provide the most efficient magnetic circuit. The periphery of the magnet is heavily ribbed to give added mechanical strength and an increased radiation surface to aid cooling. Centre & Outer Poles are machine from high permeability magnet steel with cored recesses arrangement to protect heads of through tensile bolts. The faces of poles from spigot joints in magnet shell, the outer poles of larger magnets are skirted for added. The pole shoes are easily replaceable. 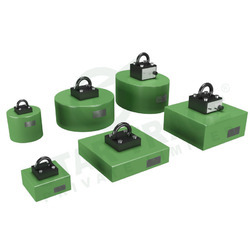 Rectangular lifting Magnets for handling Steel plates, Bars, Billets, Sections and Tubes can be designed and manufactured to meet customers requirement. The construction of these magnets is similar to above with cast steel shell and poles fabricated from low carbon steel.Very long loads can be handled with two or more magnets spaced on a spreader beam to maintain equilibrium and ensure adequate supply factor. STAR TRACE Coil Lifting Magnet has Electromagnets, its On/Off capability can be used to control automated sheet metal handling system. Through the application of controlled DC electrical Current, electromagnets offer controlled holding power and on- command release of ferrous steel parts. Rectangular & Round Electromagnets Provide concentrated holding power and high responsiveness in manual or automatic applications. 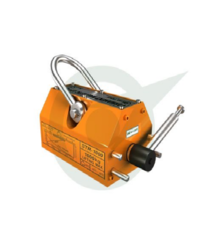 • The Parallel pole Electromagnets are Ideal for lifting or pick and place application where parts have uneven surfaces or odd shapes.They can be custom machined to specifically fit the applications. • Multi - pole Electromagnets are useful for the handling of thick ferrous items such as steel plate,forgings,die castings and other non-flexing items.